I finally got a case for my iPad. I’ve used the Apple iPad case with one of the iPads we have at the office. It seems like a nice case, and I contemplated getting one. I do think it’s overpriced at $40 (but it is from Apple.) I did some searching and found that so many cases were made of leather or some other leather-like material, or folded, or had stands built-in, or pockets, or other weird stuff. All I really wanted was a simple case to add a bit of protection. When I got my iPhone I bought the cheapest case the AT&T store had, and I actually really like it. It’s just a no-frills slip-on rubberized cover. This is pretty much what I wanted for the iPad. I typically hold the iPad with both hands, often while sitting on the couch, or while laying in bed. I do a lot of reading so it’s common for me to hold the iPad with two hands, swiping or touching to get to the next item. I didn’t want a bulky case with any sort of cover or flap to deal with. I don’t do a whole lot of typing or playing games, both of which probably lean more towards resting the iPad on your legs or something. The METROLPAD does have (at least) one annoying feature. 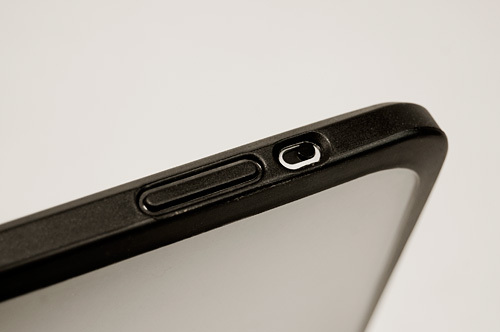 The volume control is not exposed, but instead contolled via pushing on a “rocker” type piece of the case. And I mean pushing. It takes a good amount of pressure to get it to work. Maybe it will loosen up over time (or maybe I need to hack my own solution.) The mute slider switch is also hard to move. I can get at it with my pinky finger… most of the time. 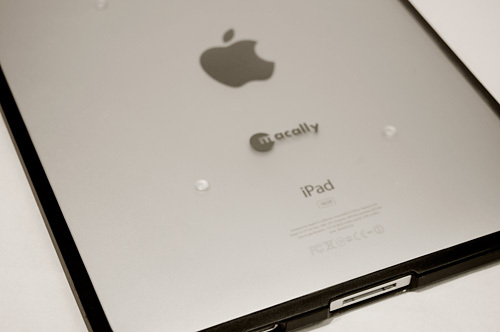 I’m really liking the Macally METROLPAD. It was well worth the $13 I paid. I’m glad I didn’t drop $40 on a different case not knowing if I’d like it or not. I’d recommend the METROLPAD if you just want a simple cover-type case. Note that I do have an old laptop sleeve I put the iPad into if it’s going in my backpack to take somewhere. If you want the best of both words, either use this case, and a sleeve, or look for another solution. This one works for me though, so take that as you will. Oh, I didn’t talk about how I stand the iPad up… Well, there’s always the next post.